Interview: Britain’s Got Talent’s Jamie Raven’s kind of magic. Upon researching the magician Jamie Raven ahead of his new touring show, the posters state he is the best performing magician ever to have appeared on Britain’s Got Talent. Those posters might need changing following Richard Jones winning the latest series of the ITV talent show. But Jamie, speaking ahead of his tour coming to Aylesbury, High Wycombe and St Albans, he isn’t bitter about losing that title. He said: “I’m delighted for Richard winning the show. The magic community is a really small one and I am really happy for him. “I wasn’t ever going to remain the best performing magician forever and if either of us can encourage more children to take up magic then that would be great. Jamie said it is the biggest tour that he has ever been on and is one that he is looking forward to. He added: “There will be lots of different magic tricks. There will be some card tricks, some close up some mind reading and illusionism and there will even be a child levitating on the stage as well. “The reason for doing the different variety of tricks is that while I love card tricks and there is a lot of the people who like card tricks, for two hours would not really work in the theatre setting. “We are led to believe that there are seven different type of tricks, the thing to do is then try and put my own style and spin on it. While he might have been working as a magician for the past 12 years, his passion goes back even further. Jamie said: “One day I was on holiday with the family when I was 11 and there was a magician and he came and showed some magic and loved it. “I had watched magicians and enjoyed them but never thought of doing anything with it. After we had seen those tricks, the magician invited us away and showed us how he did some of the tricks and I learnt how to do three different tricks. “I had as a hobby and when I was university, I got to know an event planner and I had a phone call from him to say, the original magician couldn’t make it, could I do the show. The only problem was that it was a black tie event and I didn’t have one. He is best known as a runner up on the last series of Britain’s Got Talent and it was a show which he very nearly didn’t end up doing. Jamie said: “I was working steadily as a magician and got asked lots of time to do Britain’s Got Talent and had always said no. “The one thing about the show is that it is the quickest way to get exposure. I went from being an unknown to headlining my own West End show within the space of a few months. “However, if it had gone wrong, nobody would want to book the magician who made a fool of himself on television. “I was getting five or six gigs a week doing golf clubs and places like that for 100/200 people and wanted to do it for theatres in front of 1,200 people. But even with those positive comments, it is safe to say he didn’t expect to go much further. “I never set off to win the show, I thought if I could get through to the semi finals then that would be great. To then get through the semi finals and to the final was amazing. 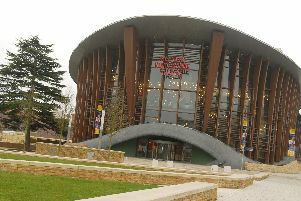 Jamie can be seen at Aylesbury’s Waterside Theatre on Saturday June 19. Tickets for the show can be booked by calling the box office on 0844 971 7607 or by visiting www.atgtickets.co.uk/aylesbury. He then visits The Wycombe Swan on Thursday June 23. For more details visit www.wycombeswan.co.uk. A day later he can be seen at The Alban Arena in St Albans. To book visit www.alban-arena.co.uk.